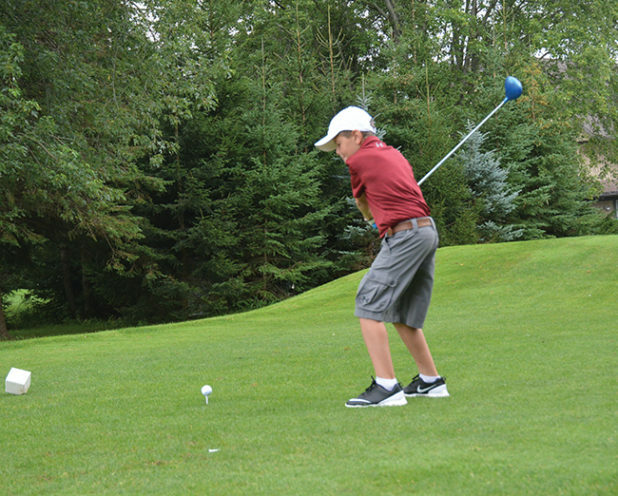 The ninth annual Jackson’s Hope FORE Hydrocephalus golf tournament got underway at the Shelburne Golf and Country Club in Shelburne on Saturday, August 19. The yearly event raises funds for The Spina Bifida and Hydrocephalus Association of Ontario. The tournament’s namesake, Jackson Ferguson, was born with hydrocephalus – a condition that causes an abnormal build-up of cerebrospinal fluid in the ventricles inside the brain. Because of this condition Jackson has undergone nine surgical procedures at SickKids hospital in Toronto that requires a shunt to be implanted to removed excess fluid. Fortunately the shut is working fine and will grow with him over the next few years. Jackson celebrated two years surgery free on March 24, 2017. An avid and talented golfer, Jackson hit the first shot to start Saturday’s tournament. The fact that he has a shunt to drain fluid doesn’t slow Jackson down at all. He’s a normal and active kid and unless you were told, you would have no idea he has the condition at all. round on the links followed by dinner and an auction in the Club House. Prior to the this year’s Tournament, Jackson’s Hope Fore Hydrocephalus has raised $48,000 for SickKids and $22,600 for The Spina Bifida and Hydorcephalus Association. The event is hosted by Jackson’s mom, Tammy Trimble. She came up with the idea to support SickKids after her son was diagnosed with the condition. The Tournament has a lot of support with people attending from around the region and as far away as Kawartha Lakes and Lindsay. Jackson himself started the tournament by driving off the tee on the first hole surrounded by all the other golfers.